Thanks to Neil's Asian market shopping-trip-on-steroids, I was able to whip up an awesome green curry this week. Having good curry paste on hand makes this such an easy task. Tasting Thai curries in a restaurant probably makes most people think it's impossible to make at home. But, trust me, find some good curry pastes, keep them in your pantry and on busy weeknights you can gather up whatever veggies and meats you have available and crank out a delicious and different meal. If you're anything like me, different is important. I get bored very easily! A small can or jar of curry paste will actually go quite a long way. I scoop it out by tablespoonfuls and freeze on wax paper. Once frozen, I put into a freezer bag and save for later. This is also a good thing to do with tomato paste. Seems like every recipe only calls for a tiny bit of it, then you're stuck with an opened can that usually goes bad in your fridge before you can use it up. Freeze it and eliminate that waste. So, one night this week, I pulled out my frozen green curry paste. I had some chicken tenders that I sliced into thin strips. We had some of the pre-cut carrot sticks from Publix that I just cut into smaller pieces. Cut up a medium zucchini and de-strung some sugar snap peas. For speed, I steamed the carrots to soften them up. Then, I stir fried the zucchini, peas, and carrots. Set those aside and did the same with the chicken. 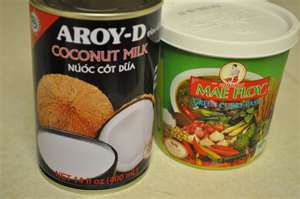 Then, I merely mixed a can of light coconut milk with 1 1/2 Tbs. of curry paste. I cooked it awhile to thicken, then added my veggies, some fresh basil leaves and meat to warm through. Then, I simply served it on top of jasmine rice. It's never the same experience as going out and enjoying Mai Thai, but being able to put together a quick and yummy Thai dish at home is wonderful. If you'd like to infuse some ethnic food into your daily grind, this is a surprisingly easy way to accomplish that goal! Tales from the "Blue Cookbook"
I ate a BLT & lived to tell about it!